The infinite care taken by the architectural firm, Gallagher Lourens, in the design of this building is evident from the start; from the design of the brochure and other documents prepared for the adjudication process, up to the smallest details of the completed building. 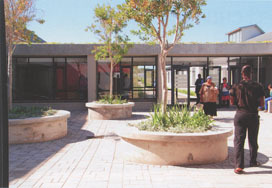 The centre, commissioned by the Western Cape Provincial Government's Department of Transport and Public Works, replaced three small existing clinics. This consolidation took place in order to offer a more comprehensive range of health-care services.The centre provides the full spectrum of primary health-care services, namely: women's health; child health; mental health; infectious diseases; oral health; rehabilitation services; and chronic care (Architect's Report). It is situated adjacent to the community of Zwelihle in Swartdam Road, opposite a fully functioning market. The Hermanus industrial area is also in close proximity. This area between Hawston and Hermanus is on the relatively narrow coastal plateau between the Atlantic Ocean and the Hottentots Holland Mountains. The profile of the mountain range to the north dwarfs this building and all other buildings in the vicinity. It is this play between the horizontality of the site and the majesty of the mountains in the background that the architects have succeeded in capturing, in an inspiring manner, in the design of this building. Entrance to the centre is from the west (Swartdam Road), just opposite the market. The architects' careful design of the street edge, along with the profile and the scale of the building, immediately create a sense of 'place' in the area. It is not simply another soulless building that one would pass in the street without noticing. The urban and architectural design immediately creates a sense of civic pride and human dignity. Users enter the building by means of a colonnaded canopy and a semi-public courtyard, which face immediately onto a helpdesk once inside. The public circulation in the building is clear and direct, making use of colour, signage, natural light and connections to the outside to orientate and give direction to users. The building's public 'pattern' so to speak, comprises a series of courtyards (of varying functional purposes) enabling waiting areas to directly relate to nature, while a series of north-facing roof monitors ensure ample daylight, even in the smallest of spaces. Many people experience a sense of vulnerability and apprehension when using health-care facilities. In such instances, we tend to focus on the immediate details of the physical context, while the sensory experience becomes acute in our minds. The architects understood this reality rather well and have created a semi-public and private environment, where both the users (patients) and healthcare workers can wait, work and interact in a dignified and humane manner. The core urban and architectural ideas underpinning this building's design are geared towards fostering and enhancing human dignity. Every detail, whether big or small, is carefully considered to support human physiological wellbeing and good health. So often, the demands of modern medicine result in health-care buildings becoming 'factories' or 'machines'. While not ignoring various stringent requirements, this building is the exact opposite of the aforementioned way of doing things, as it places human needs first. Furthermore, the way it is placed in its immediate urban and larger natural context anchors it in its social, cultural and physical context creating 'place', social reference and meaning where it is most needed. The manner in which the architects have gone about the necessary functional requirements, and the way in which they have dealt with the macro and micro context, are exemplary. This should act as a benchmark for all similar buildings in South Africa.